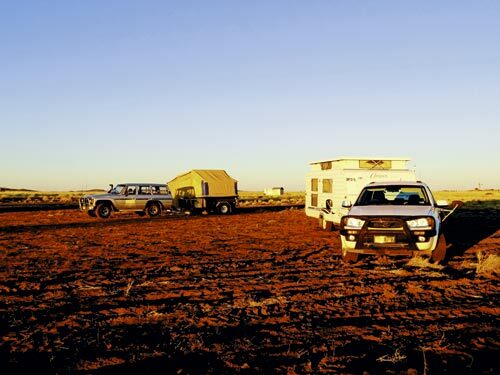 There has always been debate among caravanners about the best way to power your lights, TV and appliances while you’re offroad or on an unpowered site. 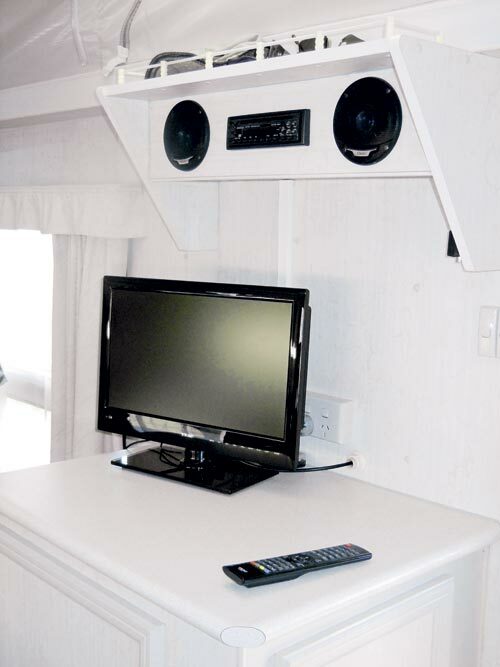 And in recent years, there’s been a trend towards large vans, which can be more like upmarket apartments than traditional caravans. 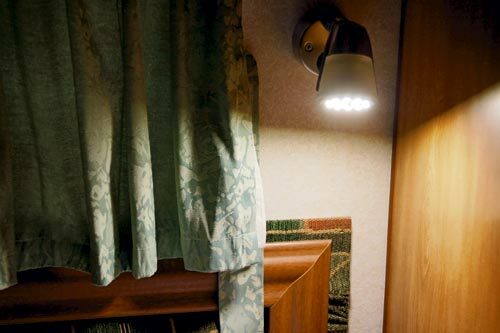 They certainly appeal to retirees new to caravanning and the manufacturers are quick to adapt to what the consumer wants. 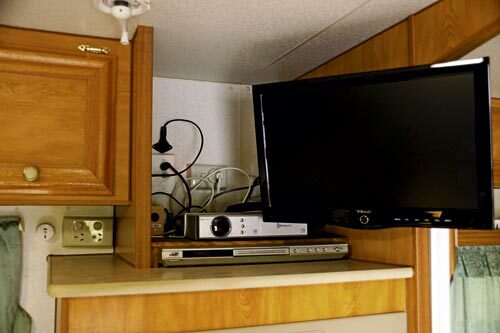 But the power needed to run all the electricals and electronic equipment in big vans is most easily supplied by a 240V powerpoint in a caravan park. Inverters are available, but power is lost converting 12V to 240V, so they are best used for short term needs such as electric razors. Even with a large deep-cycle battery and a solar panel, staying offroad for even a couple of nights becomes problematic without running a generator for hours. One solution may be to install a second battery and more solar panels – we once saw a van with three large batteries in the front boot. Unfortunately, all the batteries were flat because the solar panels could not keep up the charge to all three, even in sunny weather. Another solution is to try to reduce power usage wherever possible. In our yachting days, we were used to life with 12V power and tried to minimise the intrusive sound of the motor running to charge the batteries when we were sailing. It is quite possible to spend several days at a time on battery power without needing either solar panels or a generator. In fact, we find we are limited more by the amount of water we carry than by power usage. In any case, it is useful to know where most of your power is being used. For example, 12V water pumps are heavy power (as well as water) users. Minimising you’re power usage when you’re offroad means you need to carry less fuel for the generator, which reduces noise and fumes, making camping more pleasant for everyone. Honda will be sufficient to power a small fridge, water pump, lights and a 19in LCD TV. 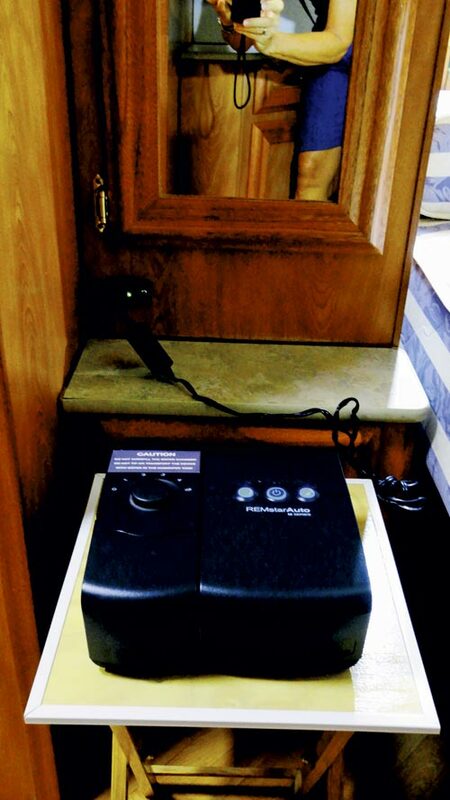 People with CPAP machines will require one to run their 240V machine, although 12V machines are now available. But on the downside, generators take up room in your vehicle, they are heavy and require that you carry fuel. You will also require a pure sinewave generator to power sensitive electronic equipment. A few national parks have special areas put aside for generators, although they are not allowed in most. Solar panels can be an excellent option for those who don’t have to run a microwave, air-con or other power-hungry equipment. 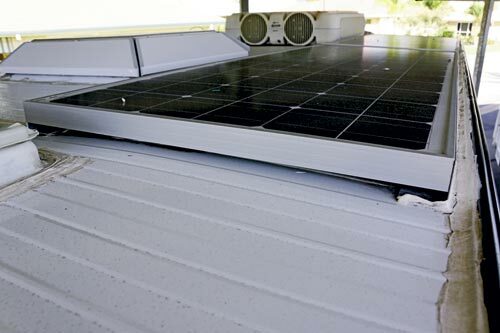 The main problem with roof-mounted solar panels is you need to have your van parked in the sun for maximum efficiency, and most people look for shade when they set up camp. 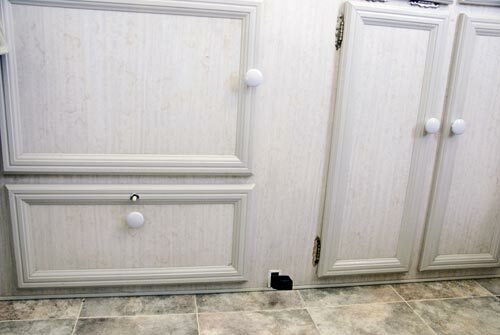 Free-standing panels are an alternative, but I have heard of several incidences where vanners have gone for a walk or a drive into town for supplies, or left their van for some other reason, only to return and find their panels stolen by someone who thought they could put them to better use! No matter what type of solar panels you purchase, they are expensive and many travellers find they do not supply enough power to run all their appliances, particularly compressor fridges, in anything other than sunny weather. Buying an extra battery and extra panels adds to the weight and cost. We had our van built to support us on 12V power when staying away from mains, so we use a foot-operated marine water pump in the kitchen. It is efficient as it pumps water on both the up and down strokes, and it means we can use both hands while pumping water. It also minimises water wastage. We had the same type of pump on our charter yacht, and it has never given us any trouble. 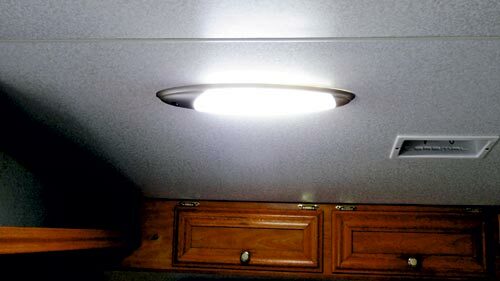 We have only 12V fluoro lights in our van and each can be run on one, two or three 8W tubes, giving excellent light. They also run cold. 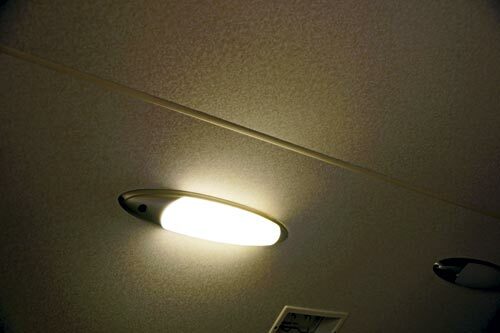 Nowadays, LEDs might be a better option – our outside light is an LED and it uses minimal power. 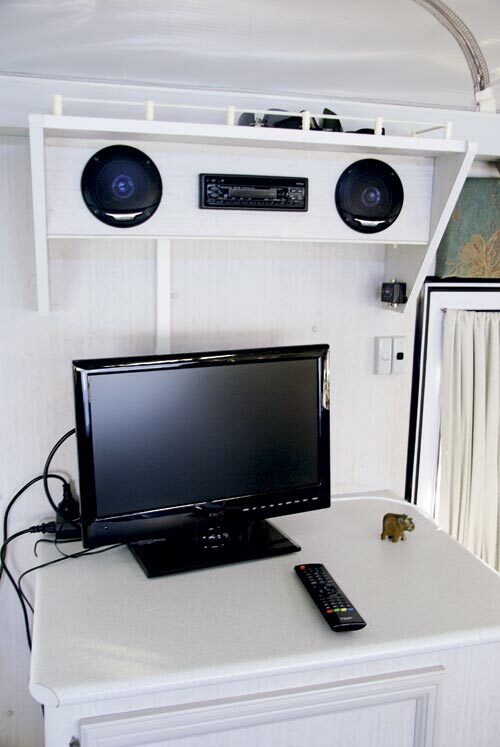 We have four 12V outlets in the van, allowing for TV, fans and any other 12V appliance we might need. We also have a 12V car radio/CD player and we’ve noticed that the CD player uses more power than the radio, particularly if the volume is turned up. Another option would be a small portable radio running on its own disposable batteries. Our TV antenna booster, which is not an automatic roof-mounted one, uses either 12V or 240V, and the power used on 12V does not even register on our ammeter. Our TV is a 19in TEAC LCD-LED that can run on either 12V or 240V. Our fridge is a three-way tropical Dometic, so we use gas while we’re away from mains. Cooking is via a gas stove and grill (plus microwave for powered sites), although we prefer to have an outside barbecue or cook in the camp oven when possible. Due to our caravanning experience over the years, we now know how to pack our van’s fridge efficiently. There is always room for two cans of beer (and a bottle of wine for Denyse), as well as at least one week’s supply of food. We don’t need to carry an extra fridge/freezer, which greatly reduces our need for power. Our power is supplied by one quality 115Ah sealed battery in the van’s boot, together with a voltmeter and ammeter which tell us all we want to know about power usage and the state of the battery. We also have a 25A smartcharger that we use if required on a powered site, although we mostly just charge directly from the car when we’re driving between campsites. Our phone and cameras can be charged in the vehicle or with our Sony USB portable power supply. We charge our laptops when we’re on a powered site. The system is supported by a Redarc battery stabilising unit, which also means we can start the car from the van battery if the car battery is flat from leaving the car lights on or some other failure. When our usage is analysed, it’s clear that we use very little power. Even our 19in TV uses only about 1.5A. 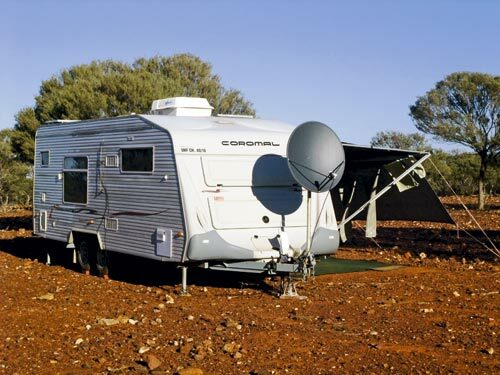 We stayed in one spot at Eighty Mile Beach in Western Australia for six nights, using all our normal lights, TV and 12V fan and still had plenty of battery power left. But if we did want to stay longer, it is just a matter of hooking the Anderson plug from car to van and running the car for a while to charge the battery. With normal use, we run out of water before we run out of power. Most of our offroad stays are around three days, so we have found this an excellent system without going to the expense of either a generator or solar panels, and we don’t have to find room in our van to carry either. It is simple, it works, and it is a perfect alternative for us. That doesn’t mean it will work for you, of course. If your power needs are great, or you require special appliances/equipment, then it’s likely you will need to investigate your options further. 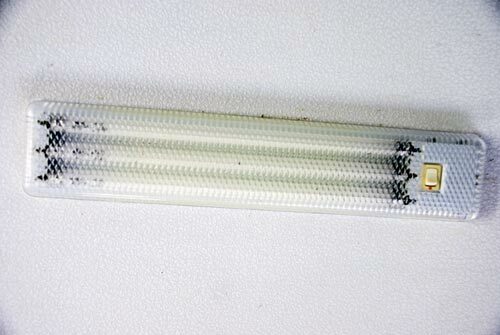 EXPERT TIPS AND TARICKS FOR AN EFFICIENT 12V SETUP. Staying at Cape York’s Loyalty Beach late last year in the Topaz Series II hybrid caravan reviewed in the last issue of CW, we ran out of power. We had been on an unpowered site for about two days before deciding to spend a day-and-a-half on Thursday Island. When we returned, our portable fridge-freezer mounted in the Topaz and the van’s built-in 80L 12/240V main fridge-freezer were both off and warm. Fortunately it wasn’t a disaster, but we had expected longer cooling life from the Topaz’s standard, single 115Ah AGM deep-cycle battery and the 120W solar panel on the roof that was meant to trickle-feed it in such circumstances. But, after talking to renowned 12V power specialist Alan Johnson, who founded Melbourne’s Piranha Offroad and carries out more than 1000 battery conversions a month, I now realise that I had expected too much and the fault was mine. Quite simply, we had been greedy. For a start, we hadn’t calculated the power usage of our appliances. A typical portable 39-47L fridge-freezer features a highly efficient compressor and draws about 2.5Ah, so if you are running it flat-out in the freezer (-0°C) mode, the thermostat is bypassed and the compressor will run continuously. This means it will flatten a fully charged 100Ah deep-cycle battery in about 40 hours, or say two days, as these batteries leave a little in reserve. In refrigeration mode (usually 3-4°C), the thermostat will cut the compressor in and out, so the ambient temperature, the fridge’s contents, and the number of times you open the door/lid will affect how much of any given hour the compressor will run. If it’s hot and it runs for 30 minutes in every daylight hour – and less at night – to maintain that temperature, it may refrigerate its contents, but not freeze, for up to four days. A valuable tip of Alan’s was that a full fridge will retain its temperature longer than an empty one, with the ‘thermal momentum’ of cold beer, water, etc., supporting the chilling process. 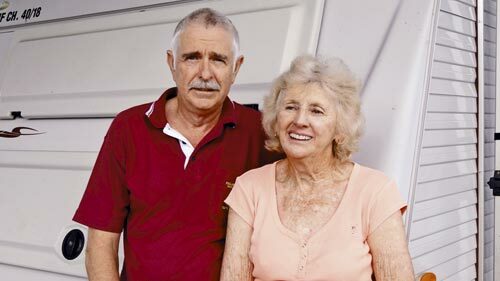 Therefore, when he travels with a lightly loaded fridge, he adds bottles/milk cartons full of water, along with a couple of packing towels, to stop them splitting when travelling over corrugations. Of course, fridges are just the start of the 12V power drain. And many people take their caravans well away from 240V, and with them a greater array of equipment than ever, from portable coffee machines to hair dryers. Inverters are all the rage, with the largest ones allowing you to run all manner of 240V appliances, but remember Alan’s fuel tank rule? As Tony Allsop points out in the adjacent story, a bank of batteries is not the answer, either. Consider a foot pump instead of a 12V water pump. 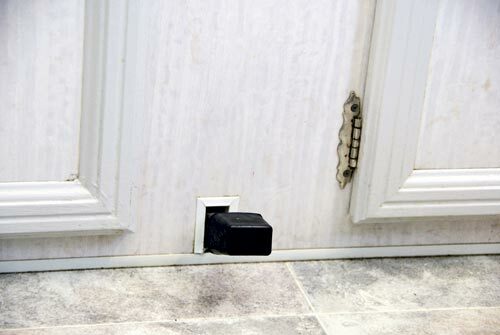 Install several 12V plugs rather than running several appliances from one point. 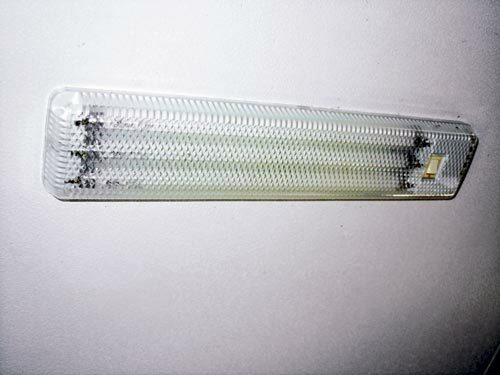 Change all your lights to LEDs. Use 12V fans instead of air-con. Pack your fridge well so you don’t need to take an extra one. Use a three-way tropical fridge rather than 12V/240V. 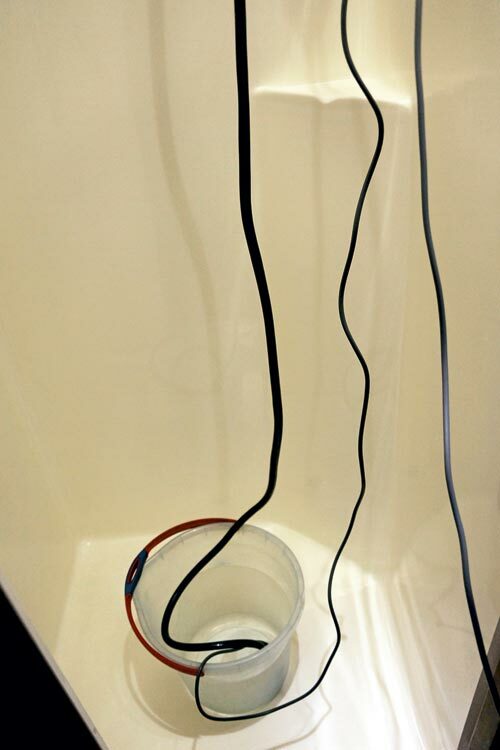 Use a solar shower, or buy a cheap submersible pump (around $30) to draw water out of a bucket for your shower as it uses less power than most ensuite pumps and saves your tank water. Choose a good quality battery of about 115Ah for your van. AGM batteries make more of the stored power available. Fit a voltmeter and ammeter so you always know the battery voltage and how much power each item consumes. So how should you equip your van for optimum 12V self-sufficiency? Alan suggests fitting a second AGM deep-cycle battery to your tow car, along with a battery management system, to ensure that your vehicle’s alternator is not overloaded and your main starting battery won’t run flat. Ensure minimal power loss from your tow car’s charging system to the single, or ideally, dual 110-110Ah deep-cycle AGM batteries in your van by having both wired to accept at least 10mm squared cable, via an Anderson plug connection. 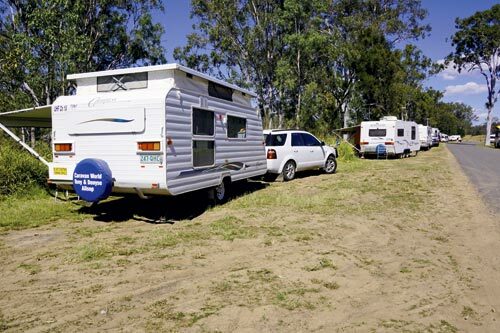 Your standard round or flat caravan plug is not enough – it won’t pass on enough charging current. You need larger cable to carry 12V than you do for 240V. Run a separate portable fridge/freezer off the deep-cycle battery in your tow vehicle if possible, rather than your caravan, so that when you leave your van to do short day trips you’ll be topping up your power bank independently of your van. 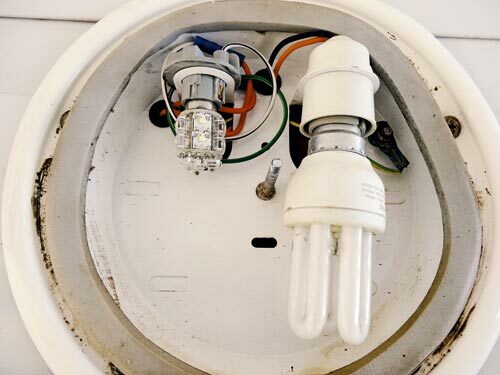 Investigate gas-powered appliances over 12V ones. There are a surprising number of options on the market. Heating water with gas is much more efficient with electricity. Finally, apply some common sense to conserving power: check the brochures for each appliance you are likely to use and add up their likely power drain; learn to live within your limits; minimise opening your fridge or freezer door; use a hand or foot pump to draw water rather than your van’s electric pump; and replace incandescent globes with fluorescent or LED lights. Enjoying 12V power for longer in a Topaz is a simply matter of ticking the right option boxes and following a few simple rules according to Track Trailer, who were similarly surprised by my loss of 12V power on the Cape York trip. Specify the second 110W AGM deep cycle battery option. 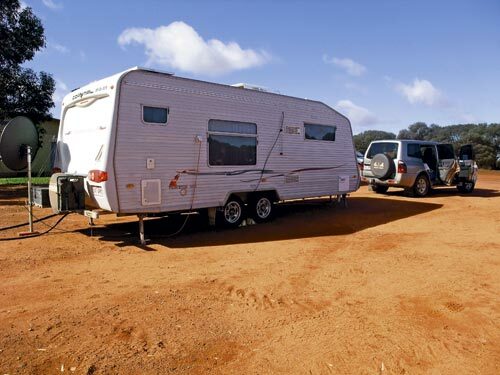 Have a Redarc SmartCharger fitted close to the caravan’s deep-cycle batteries to ensure that they receive the full 13.9-14V charge from your tow vehicle when travelling. Park in the sun if possible to get maximum charge from the optional Topaz roof-mounted solar panels. If you’d rather not, pack a pair of 80W portable solar panels to supplement the roof panels, as they will allow you to capture the maximum light by following the sun. 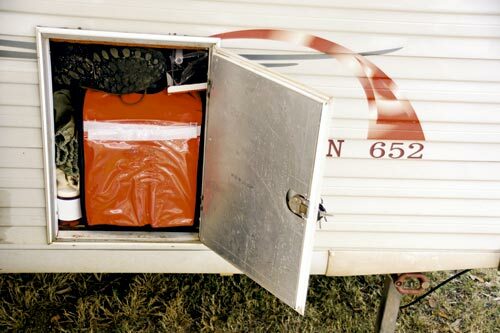 Run your portable fridge-freezer off your tow vehicle’s deep-cycle battery instead of the van’s. Use the Topaz’s manual water pump connected to the external shower instead of running your electric pump unnecessarily. 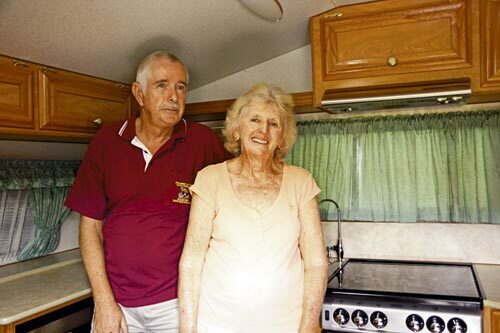 John and Dell Stronach, from Mackay, Qld, have a 6.5m (21ft 6in) Coromal Princeton caravan. 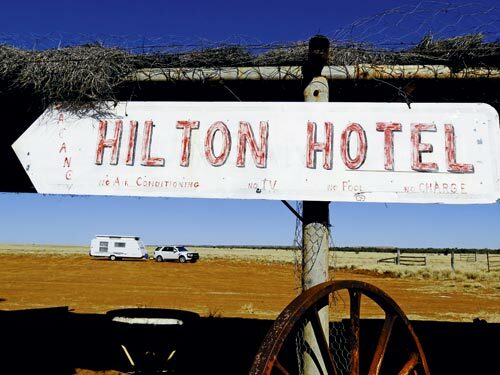 They are keen gold prospectors and take their van, towed by a Pajero, all over Australia in search of gold. They stay mainly offroad, and for over a week in many places. Dell uses a CPAP machine, which runs on 12V, and they have only one 120Ah AGM battery. They have two 130W solar panels, which supply most of their power needs in good weather. They carry a Honda 20i generator for those rare times they require van heating/cooling via their air-con, microwave cooking, or when it is cloudy or wet. The inverter is used only to power John’s electric razor. They have replaced all their lights, inside and out, with LEDs and instead of using their van’s ensuite shower pump, they use a less powerful submersible one, sucking heated water out of a bucket. This means they can use any available water, saving their tank water for drinking and cooking. 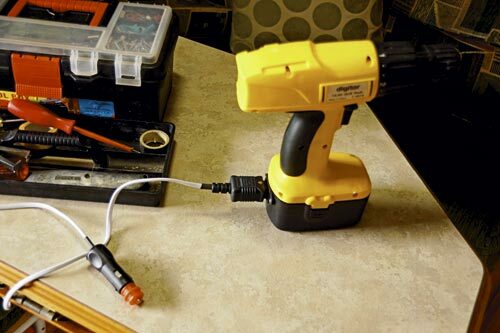 An old 12V drill has had the dead battery removed and John has converted it to 12V using a cord to his cigarette lighter point. 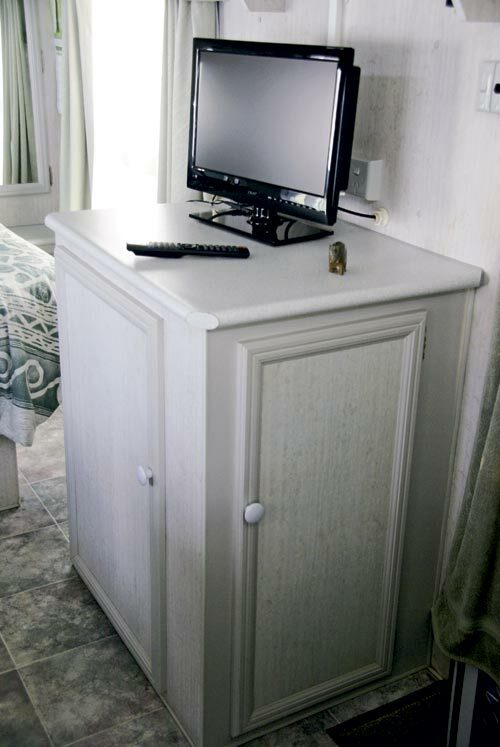 Their TV (an LCD-LED model) and entertainment setup is permanently on 12V. He uses a satellite dish for TV reception and they do not carry an antenna. They also pack their three-way fridge well, so they find they do not require a second one. It runs on gas when offroad. The CPAP machine has a dedicated 12V plug on Dell’s side of the bed. Originally published in Caravan World #512, March 2013.